I finally got back to sewing this week, out of necessity. I had promised Max's school's PTA that I would make a pair of tote bags to go along with a set of other stuff I was putting together for a silent auction. While I know that had I failed to finish these, that no one would have come after me, demanding a tote bag, I still felt it necessary to make good on my promise. So on Tuesday evening, just after dinner, I set to work sewingsewingsewing and finally finished the bags and bundling up the rest of the auction package at 2am. The two on the left, the purple stars on white (it looks just white in the picture above) and stars on beige, are the ones I finished Tuesday and are for the auction. The one on the right (I call it "electric raindrops") was my test bag, finished a week ago. 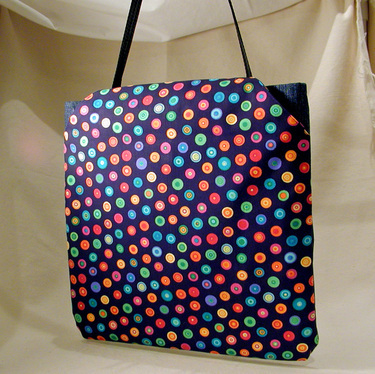 I liked the tote bags I had made before, but I wanted some sort of closure for the bag. 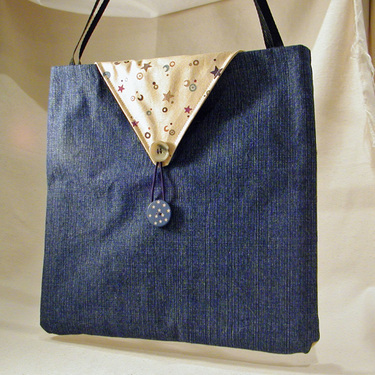 I worked up this design, where the front pocket extends up and over the top of the bag and loops over a button on the back. The extra flap can be tucked inside the pocket if you don't want to close it. I like this design, I think it's more useful than an always-open tote bag. They're lined in mattress ticking as usual, but I think I'll switch to coordinating fabrics instead, next time I make one. I stuffed the bags with goodies from our local observatory (that's why the bags are star-themed). I really hope someone bids on these packages. I think that when I go to the event tomorrow night, I'll just avoid the table that these are on, it would be too hard for me to see them if they were being ignored.